On Oct. 3, the Supreme Court of the United States opened its 2016-2017 term. There is only one religion-related case in the current docket — Trinity Lutheran Church of Columbia v. Pauley, which deals with church-state separation. But looming over the current session is a question crucial to many groups, both religious and secular — who will replace the late Justice Antonin Scalia, who died in February? Scalia, a Roman Catholic, sat on the court for three decades and heavily influenced the way the Constitution has been interpreted. Donald Trump has submitted a shortlist of potential Supreme Court nominees, while Clinton has left people guessing. That present numerous possibilities for the future religious makeup of the court, currently composed of five Catholics (John Roberts, Sonia Sotomayor, Anthony Kennedy, Clarence Thomas and Samuel Alito) and three Jews (Ruth Bader Ginsburg, Elena Kagan and Stephen Breyer). This edition of ReligionLink is intended as a resource for covering the court as it considers the Trinity case on the brink of a new, post-Scalia era. Moore v. Texas — This case involves capital punishment and how states determine if a criminal is ineligible for capital punishment due to an intellectual disability. While it it does not deal directly with questions of religion, this is a case many religious groups and individuals will be watching. The Supreme Court of the United States maintains its calendar here. SCOTUSblog also posts a detailed Supreme Court calendar. 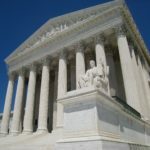 SCOTUSblog has biographies of each of the Supreme Court justices. SCOTUSblog has a “plain English” description of Supreme Court procedure and terms. The Miller Center at the University of Virginia maintains a list of selected religion cases heard by the Supreme Court that dates back to 1844. The Bill of Rights Institute maintains a list of “Landmark Court Cases” on religious liberty heard by the Supreme Court between 1879 and 2010. A Look at the Supreme Court 2016-17 Term” on Sept. 28. The program is available as a webcast. Read “Overview of the Supreme Court’s October 2016 Term” by Elizabeth Slattery and Tiffany Bates of the Heritage Foundation. Read “Supreme Court may be converting on religion” by Richard Wolf in USA Today, July 30, 2016. The takeaway: Some say the court is more concerned with preventing discrimination than protecting religion in recent decisions. Read “Messing with Texas: Supreme Court will hear two death penalty appeals” by The Economist, June 7, 2016. The takeaway: The Moore case has been so diluted any decision will be a minor one. Read “Merrick Garland Shouldn’t Get His Hopes Up” by Noah Feldman for Bloomberg View on Sept. 19, 2016. The takeaway: If Clinton is elected, Republicans are unlikely to approve Garland, an Obama pick, as one of their last deeds. Read “It All Comes Down to the Courts” by Brianne Gorod writing for the fall 2016 issue of Democracy. The takeaway: Progressives may be on the rise. Read “Hillary Clinton’s Supreme Court Shortlist” as compiled by David Lat at Above the Law, Aug. 1, 2016. The takeaway: This speculative list is diverse but does not include Barack Obama. Read “Donald Trump Releases List of Possible Supreme Court Picks” by Alan Rappeport and Charlie Savage for The New York Times, May 18, 2016. The takeaway: He picked 11 white people, eight of them men. Read “How Scalia’s death may have killed Supreme Court conservatism” by John Hudak of the Brookings Institution, Feb. 15, 2016. The takeaway: The current eight justices are evenly divided on many social issues important to political and religious conservatives. Floyd Abrams is an attorney at Cahill Gordon & Reindel in New York City. He is an expert on the First Amendment and free speech. For 15 years he served as the William J. Brennan Jr. Visiting Professor of First Amendment Law at the Columbia Graduate School of Journalism. Jesse H. Choper is emeritus professor of public law at the University of California, Berkeley. He is an expert on church-state issues and U.S. Supreme Court decisions regarding religion. He is the author of Securing Religious Liberty: Principles for Judicial Interpretation of the Religion Clauses. He was a law clerk for Chief Justice Earl Warren. Paul Finkelman is a professor of law and public policy at Albany Law School in New York. He is an expert in constitutional history and constitutional law, freedom of religion, the law of slavery, civil liberties and the American Civil War, baseball and the law and religious monuments in public spaces. He has written prolifically about the First Amendment and religion, including Landmark Decisions of the United States Supreme Court (with Melvin I. Urofsky). He can discuss the religion-related cases up before the court. Linda Hirshman is the author of Sisters in Law: How Sandra Day O’Connor and Ruth Bader Ginsburg Went to the Supreme Court and Changed the World, as well as a lawyer who has argued before the Supreme Court. Contact via Harper Collins Speakers Bureau. David T. Pride is executive director of the Supreme Court Historical Society, a nonprofit founded by Chief Justice Warren Burger in 1974 to preserve the history of the Supreme Court. Pride can discuss the court’s history of religious cases and the religion of some of its past justices. Eric Rassbach is deputy general counsel at the Becket Fund for Religious Liberty. Diann Rust-Tierney is executive director of the National Coalition to Abolish the Death Penalty. Contact via Tamara Thompson, director of development and communications. She can discuss Moore v. Texas and religious opposition to the death penalty. Carrie Severino is the chief counsel and policy director for the Judicial Crisis Network. She previously served as a law clerk to Supreme Court Justice Clarence Thomas. She can discuss Trinity Lutheran Church of Columbia v. Pauley and Moore v. Texas. Neil Siegel is a professor of law and political science and co-director of the Program in Public Law at Duke University in Durham, N.C. He is an expert on constitutional law and theory, and the Supreme Court. Much of his recent work has been on the Affordable Care Act. He clerked for Justice Ruth Bader Ginsburg.